Struck to commemorate the 10th anniversary of the Vietnam Veterans Memorial in Washington, D.C., this U.S. silver dollar proof features the hand of a veteran pressed against the names of those with whom he served. The reverse depicts the Armed Forces Expeditionary Medal, Vietnam Service Medal and the Republic of Vietnam Campaign Medal. It’s a touching tribute, and a personal favorite of obverse designer and former U.S. Mint Chief Engraver John Mercanti. Mercanti has produced more medal and coin designs than any other U.S. Mint employee, so that’s no small statement. Secure yours today! POIGNANT AND TOUCHING ONE-YEAR-ONLY DESIGN – The design of the 1994-P Vietnam Veterans Memorial Silver Proof commemorates the 10th anniversary of the Vietnam Veterans Memorial dedication in Washington, D.C., It features a hand gently touching the wall searching for a name. The image was designed by John Mercanti, the U.S. Mint’s 12th Chief Engraver. The creator of more than 100 coin and medal designs for the U.S. Mint, Mercanti said this was his personal favorite. 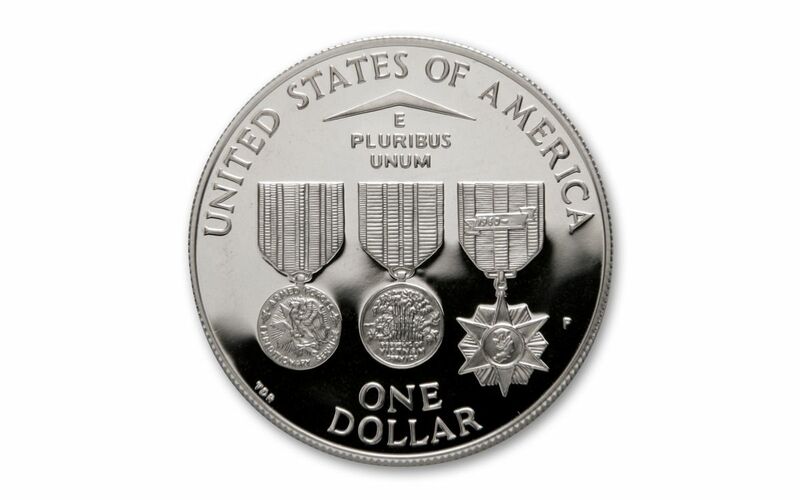 The coin’s reverse features three medals: the Armed Forces Expeditionary Medal, the Vietnam Service Medal and the Republic of Vietnam Campaign Medal. 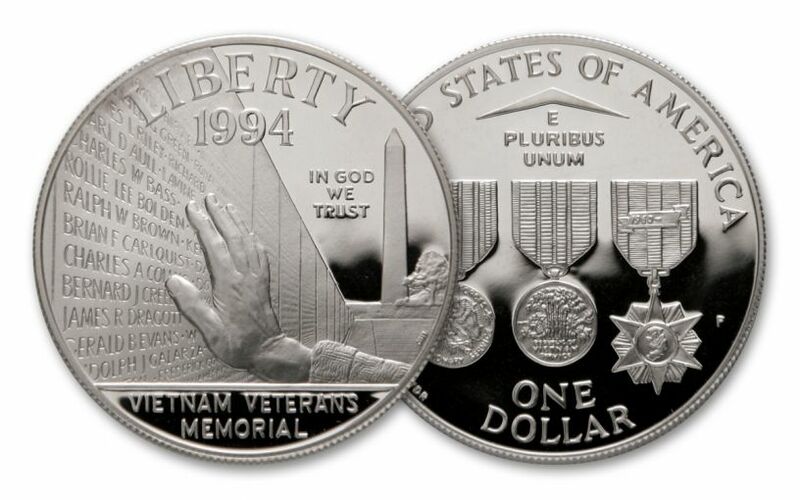 STRUCK IN FINE SILVER – Each 1994-P Vietnam Veterans Memorial Silver Dollar Proof was struck in 90% fine silver. 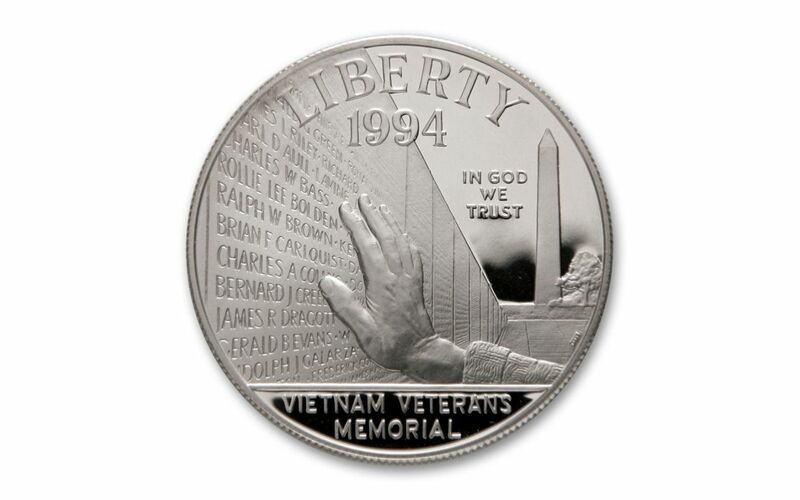 LOW LIMITED EDITION – The 1994-P Vietnam Veterans Memorial Silver Dollar is from a mintage of just 227,671 proofs.